A piece of fanart I did for +Ingress over on Google+. 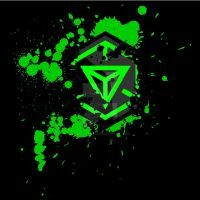 Apparently you can get an invite if you make some Ingress-related art and they like it. And I would like an invite for Ingress. Also I love Adventure Time. you should also enter this into our official Ingress Fan Design Contest @ WeLoveFine.com. Peeps @ Niantic labs will DEFINITELY see it! Are you @ Resistance or Enlightened? Sweet, 2 of my favorite things together, Ingress and Adventure Time! i wouldnt play it....all it is, is a way for google to exploit you into gathering data for them. hell they do it already with chrome, any android phone, gmail. they are the worst with spying and using personal information. even worse than facebook being just a huge marketing ploy. How'd it go? I just got an invite last week (and literally ungraded to a compatible phone days later). It's pretty awesome from my end. This one didn't get noticed at first, so it was my Enlightened poster that landed me the invite.